LED headlight, 17 lumens, 13 hour run time, 15 meter beam distance, 8 LED white, 2 red blinking LED. Push button switch. Uses 3 AAA batteries, included. 2.3" L x 2.7" W, .28lb. Includes 4 colored filters, red, green, blue and yellow, plus clear. Rubber bezel cover holds filter in place. Fits HP7R, HP7, HP7TAC, PX46, PX45, TX44, TX40, G40, G35 and HL8 flashlights. 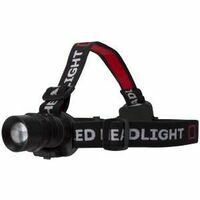 Adjustable light head and elastic head strap for hands-free use. Top mounted On/Off slide switch. Panel swivels 50 degrees. Three 5MM LEDs give 70 hours run time and 28 lumens for a 15 meter beam with included 3 AAA batteries. Lightweight construction, 13.5 lumens, 13 hour run time. 3 super bright white 5MM LEDs. Clip attachment to wear on the brim of a hat for hands-free use. Bottom mounted slide switch. 2.68" length x 1.89" width x 1.04" height. White LED. One CR2016, 3 volt, 75mAh, 1.6mm battery included. LED Headlight, 42 lumens, 12 hour run time, 20 foot beam distance, 8 LED white, 1 LED red ,1 LED green. Push button top switch. Panel swivels 50 degrees. 2 brightness modes, 8 LED high, 4 LED low. Uses 3 AAA batteries, Included. 2-3/4" L x 1-3/4" W. Red, blue colors. Compact, lightweight cap light clips to cap above the brim. Three light modes, white high & low and red for night vision. Electronic switch works with gloved hands. Impact and water resistant. 85 lumens, 4 hours run time. Includes four AAA Energizer MAX batteries. Powerful LED headlamp beam. Up to 4X brighter than standard LED technology. Impact resistant. Slide switch. Includes adjustable elastic headband and 3 AAA Energizer MAX batteries. LED spot beam headlight, 134 lumen, 12 hours of run time and 3 brightness modes, full power, half power and strobe mode. 118 meters beam distance. Push button top switch. Uses 3 AAA batteries, included. Plastic. 2.75" Width x 1.5" Depth x 1.5 Height, .25lb. Broad even beam, lights up a large area, indoor or out. 175 lumen output, 3 hour 45 min runtime. 56 meter (183 ft) beam distance. Front switch. Hinged attachment to position beam. Impact and water resistant. 4.4 oz. / 125 g (including batteries). Uses 3 AAA batteries, included. Aluminum construction, adjustable elastic head strap. Reflector focuses the beam to project over 100 meters. Push button switch on the side, ratcheting device for angle adjustment. Full power and half power settings. 115 lumens, 2 hour run-time with included 3 AAA batteries. Adjustable elastic head strap for hands-free use. Top mounted push button switch. 80 lumen white LED and a red LED. Gives 63 meters beam distance and 7 hours run time with included 3 AAA batteries. Five white, one red LEDs. Broad even beam, lights up a large area, indoor or out. 145 lumen output, 6 hour 57 min runtime. 57 meter (186 ft) beam distance. Front dual switch, each color controlled independently. Hinged attachment to position beam. Impact and water resistant. 4.4 oz. / 125 g (including batteries). Uses 3 AAA batteries, included. Bright and multi-functional. 200 lumens, up to 50 hours runtime, dual-color red and white LEDs. Multiple modes, including high and low white spot and white flood or red flood mode to preserve night vision. Water-resistant (IPX4), impact-resistant (drop-proof to 2 meters) polycarbonate body with a comfortable, high quality adjustable strap. Can be angled 90 degrees. Powered by three included AAA batteries. Focusing headlamp with adjustable focus and light dimming functions. From spot to flood. Larger power switch and easier-to-grip focusing bezel. Dimming function adjusts light output to just the right level. Expandable Z-cord provides power to the LED from the battery pack and is built in to the headband to reduce the possibility of snagging. Unbreakable LED, impact and water resistant. Twist focus. 305 lumens high/4 lumens low, 1 hour 30 min. high/70 hours low run time, 119 meters high beam distance. Adjustable elastic straps. Hinged beam adjustment to position light where needed. 4.4 ounces (including batteries). Tested and rated to ANSI/FL1 standards. Uses 3 AAA batteries, included.